CES 2019 has been a fantastic display of new, innovative smart home gadgets, with everything from robot vacuum cleaners to smart security systems impressing the crowds at the consumer tech show. With over 26 billion connected devices predicted to be installed globally in 2019, the IoT (Internet of Things) market is a booming industry, and it’s little wonder when you consider just how useful many of these gadgets are – they can turn your dumb home into a smart hub, one that can turn your thermostat up, lock your doors, and play your music with a simple voice command. CES is, of course, one of the best places to discover emerging smart home devices. Here’s our pick of the best smart home gadgets to come out of the consumer tech show this year. Following on the success of its Smart Display, Lenovo announced a trio of smart devices to add to its Smart Home Essentials range at this year’s CES, including a Google Assistant-enabled smart alarm clock called the Lenovo Smart Clock. It features a 4-inch touch-enabled IPS display that's capable of waking you up with light, just like how the Philips Hue smart bulbs do when you set up a “wake up” routine. This should make for a gentler wake up call than you traditional alarm or the one on your smartphone. You can also set sleep routines and control your smart-home setup with a “Hey Google” or “OK Google” voice command, listen to music while you lie in bed, and charge your handheld devices thanks to a rear USB port. Thanks to its 6W speaker, you can also play tunes through the smart clock, as well as streaming shows and movies onto your television by linking it to a Google Chromecast. It’s expected to hit shelves around March or April with a price tag of $79.99 (about £65/AU$110), with global prices still to be confirmed. One of the weirdest gadgets we saw at CES 2019 was a plank of wood. No, we're not joking. 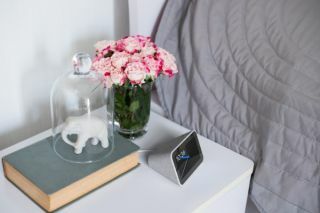 Capstone Connected Home announced the launch of its Google-enabled Smart Mirror, with both voice and touch screen capabilities at this year’s CES. The Smart Mirror allows you to access Google Assistant, check weather and traffic before you head out for the day, and stream YouTube – handy if you find your daily skincare routine to be a bit of a drag. You’ll also be able to access social media feeds, and “run downloadable applications”, according to Capstone Connected Home, although further details on which Google Play applications will work with the Smart Mirror are scant right now. Having Google Assistant built in to the mirror means you can even access Google Drive and type out emails using the touchscreen, getting a head start on your work before you’ve even brushed your teeth. The Smart Mirror should blend in seamlessly to any home, appearing like a normal mirror when not in use. Capstone Connected Home says that it will be available to buy in the next few months, but hasn’t yet disclosed any pricing information. Klipsch unveiled five new soundbars at CES 2019, ranging from 40 inches to 54 inches in width. The smallest, Klipsch Bar 40G, comes with Google Assistant built in, while the Bar 48W has even more options, with Google Assistant, Amazon Alexa, and Apple's AirPlay 2. Prices are said to range from $299 right up to $1,599 (around £235 / AU$425 to £1,260 / AU$2,270), and they'll be available to buy in the next few months – however, some models may not be available until the tail end of 2019. House of Marley (which specializes in high-end audio kit made from sustainable materials, and was founded by the son of Bob Marley), announced its first smart speaker at CES 2019. The Get Together Mini with Google Assistant is the latest addition to House of Marley's line of Bluetooth speakers, and is crafted from bamboo, aluminum (easily recycled), and the company's signature Rewind fabric (a combination of organic cotton, hemp and recycled plastics). The speaker is equipped with Chromecast for multi-room playback, and even serves as a USB power bank for charging your phone. It'll go on sale in August 2019, priced at $199.99 (about £150, AU$280). Evovacs has unleashed its smartest robot vacuum model yet: an AI-powered bot that uses machine learning to keep your floors spotless, without accidentally sucking up articles like socks that will prove bad for its digestion. While the concept was first displayed at IFA 2018 in Berlin, the Deebot Ozmo 960 is now ready for release into the wilderness of your home. It uses AIVI (Artificial Intelligence and Visual Interpretation) technology to create a bespoke cleaning plan, and detects objects like clothing and cables so it won't get stuck trying to devour a pair of discarded pajamas. Evovacs says that the super smart cleaning bot will be released later this year, but haven’t provided a firm release data or prices as of yet. It’s usually Philips Hue that dominates the world of smart lighting, but at this year’s CES it was Eve Light Strip that shone brightest of all...literally. The Apple HomeKit-compatible LED light strip is 2m long bendable strip of LED lights, and with 1800 lumens (compared to Philips Hue’s 1600), Eve claims the title of brightest HomeKit light strip to date. Priced at $79 in the US (other region pricing coming soon), the light strip comes with adhesive on the back so you can attach to your various parts of home for extra flair, whether that’s under your couch, shelves, kitchen countertop, or behind your computer or television. The Eve Light Strip works with the Apple Home app and Siri thanks to its HomeKit compatibility. You can easily change the colors with your iPhone, as there are pre-sets within the Home app, but like many smart lighting gadgets, the entire spectrum is available in the native app. Not to be outdone, Philips Hue launched a number of new products as part of its outdoor smart lighting range at CES 2019, with the new devices designed to welcome you home and lend some ambience to your outside space. The new range includes the new Philips Hue Outdoor sensor, a battery powered motion sensor that detects you as you approach your home, and switches on your lighting system. You can fully personalize your lighting system via the Hue app, choosing which lights (indoor and outdoor) switch on when someone approaches your home and triggers the Outdoor sensor. As well as giving you a warm welcome home, you can use this system to make it look like someone is always home and deter potential intruders. It will be available from February 2019 for £49.99 – based on current conversion rates, this is around $65 / AU$90, however official pricing is yet to be released by Philips Hue. Smart home security company Ring revealed a total of 13 new products at CES 2019, but one of our favorites was the new Door View Cam. It works like Ring’s previous doorbell cameras, but instead of replacing your doorbell, it replaces your front door’s peephole. It's completely wire-free thanks to a battery that sits on the inside of your door, the Door View Cam requires no permanent alterations, making it a great option for renters. If you’re looking for a smart home gadget that will keep your residence safe from... well, pretty much any threat... then look no further than the Arlo Security System. It features an all-in-one Multi-Sensor that detects windows and doors opening and closing, motion, smoke, carbon monoxide, water leaks, the sound of gas leaks, temperature changes and more. If anything at all changes in your home, you’ll be notified immediately though the Arlo app on your phone. You can also set the Multi-Sensor to trigger other Arlo devices connected to the Arlo Smarthub. For example, you could have a camera start recording if it detects motion in your living room. It even communicates with certified third-party smart home devices (like Samsung SmartThings) so your lights could switch on automatically when you stumble into the kitchen in the morning, bleary-eyed and incapable of finding a wall switch. The new Security System also includes the Arlo Siren, which is battery-operated and suitable for use outdoors. You can position it anywhere within range of the Smarthub, and it should frighten would-be intruders with a red strobe light and blaring alarm. If you’re feeling a little more subtle, you can replace the siren with other audio (such as a dog barking or TV noise) to give the impression that you’re at home when someone approaches your front door. The home security company has yet to announce any pricing, but it says that the Arlo Security System will be available to buy in the second half of 2019.